In which I recap the areas of my house that I focused on last month — the windows (#20), the card catalog (#28), and a table pad (#36) and placemats (#88) — and why I am feeling like my minimal progress isn’t helping much. I have been continuing my quest to get our house in better shape before the baby comes, and feeling some major internal pressure to get a move on these things before I can’t, well, MOVE. I’ve been slowly working through the cleaning and chores, and I definitely feel i when I push myself too hard with the bending. Over the month of March, I didn’t really accomplish anything notable in the rooms I was supposed to clear out, but I did manage to knock a few smaller things off my list. As things turned out, I wasn’t much help in recovering our house from having the windows replaced last December. I helped push a couple of blinds into brackets, sure, but that project was almost entirely the hubs. 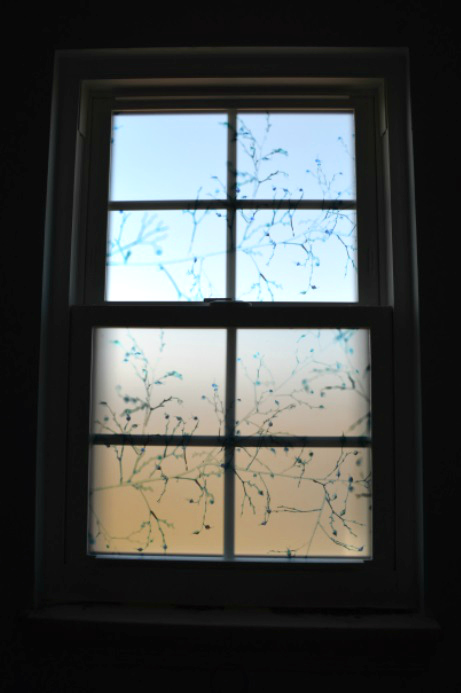 I did, however, work on the window film for the small window in the master bathroom. Since we moved in, we’ve had the ever-classy window treatment of taped up paper towels on that window. We figured there was no reason to spend money on window film for a window we knew we were going to replace. When it was finally time, I decided to treat this window as art in the room, and buy super-fun (super-expensive) film from Trove. We chose a blue delicate branch pattern in bamboo. We needed two panels of the film, which allowed us to cut it so that the image isn’t exactly the same from top to bottom. After a bunch of measuring and squeegee-ing, I love the result. This picture is obviously not the greatest, but I wanted you to be able to see the pattern. In person, it is light and airy while keeping our bathroom private from the common areas behind our house. The hubs and I bought an old card catalog soon after we bought this house a year an a half ago, with the intention of cleaning it up and turning it into a console table in our entry hallway. 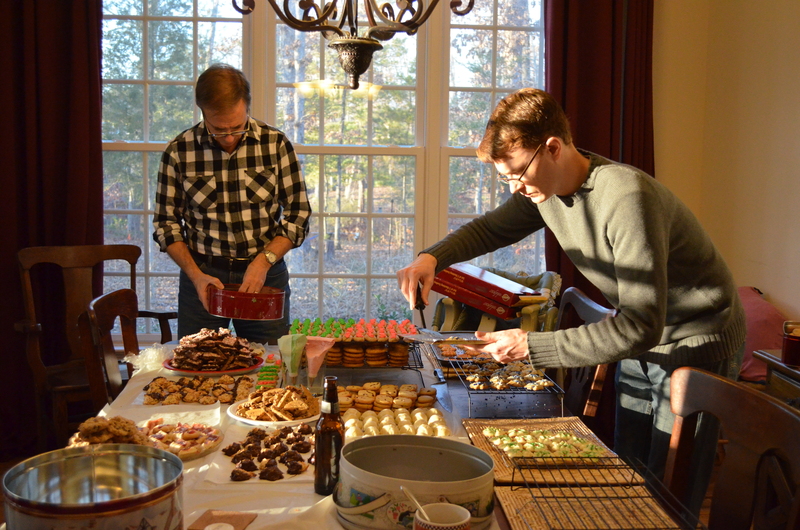 It required a lot more cleaning up than we’d hoped, so the project really stalled out for a while. I finally finished cleaning all the drawers and the base with magic erasers, which means that we only need a few more warm days for the hubs to work his magic with the refinishing product we bought — I’m exiled from it due to toxic fumes — and we’ll be able to start loading the little things we’d been storing in the drawers. We also purchased the wood for the console stand and have made most of the cuts. I’ll be helping with the final cuts before returning to exile during the staining portion of things. Then, cross your fingers that assembly will go according to our plan, and we’ll be showing off this baby by the time we’re showing off our baby! I also tackled a few other small things last month that aren’t photo-worthy, but have been nice to get off the mental to-do list. We’ve been using our dining room table more these days, and I purchased a super-long protective table pad to go under tablecloths. I finally got my mother to help me trim it to fit last month, so I don’t have to worry about folding edges under. But I love the table, so a lot of the time we want to use it without a table cloth covering it up. I wanted a new set of placemats so all eight chairs (if we ever squeeze all eight of our chairs in there) will match. We found just the thing on our last trip in a hotel in Antwerp — thin, silicone placemats that seemed pretty slip-resistant for visiting and future kids. I decided on these in moss from Amazon, and got half the set for Christmas from my in-laws. I ordered the rest after we test-drove them for a bit to be sure we liked them. I like that I can just roll up the ones I’m not using, and that they tend to disappear rather than set a theme. I am still hopeful that I’ll have a lot more house progress to report for the month of April, though we really haven’t been able to work on the things that I’d hoped in our master plan. Spring took so long to come that we haven’t been able to tackle the staining projects that I hoped we’d finish this month. But progress is progress, and I know that finishing up the nursery in May rather than April is still plenty early.